My various “note” books. At least four are for one single story. So instead of wasting more time fretting over whether or not working on the new story or an old one is the right thing to do, I have made a compromise with myself. As you can see in the above picture, I have notes for various books everywhere. 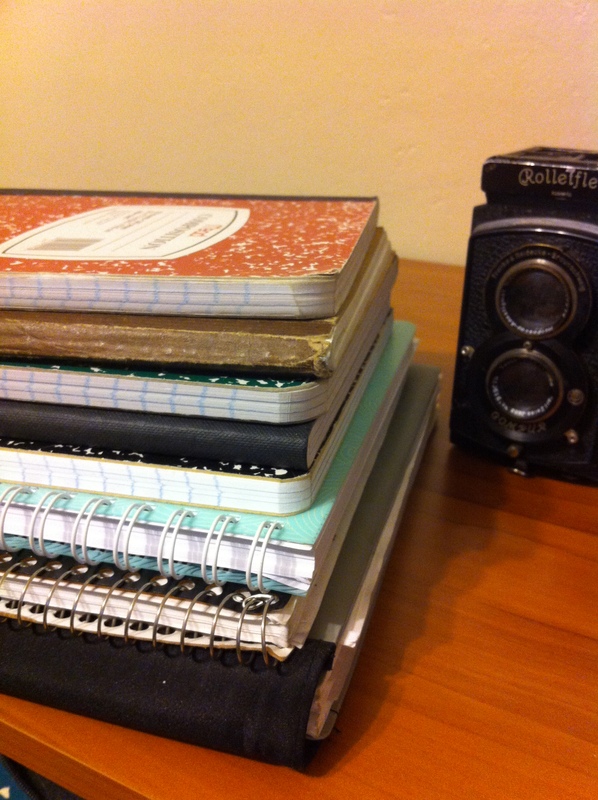 At least four of the notebooks in the picture are for my Super-Secret book. For some reason, I am terrified to condense and throw theses away. I also have a journal/notebook fetish. I love them. If I see one I like, I usually buy it, even if I do not really have a reason for it at that exact moment. There is some good news however. I recently found a NLA Group (Notebook Lovers Annonymous) and my sponsor is helping me overcome my addiction. It is terribly hard though as Martha Stewart just released an adorable office supply line. The journals are amazing, Moleskin quality with a touch of style. I will be strong and have banned myself from the local Staples. Enough with my OCD, fetishes and on to the point shall we? I have decided that I will start working on my new story, but only AFTER I have gotten all my current ideas organized and in a less haphazard system. Organization of my ideas is one of the reasons why I decided to start blogging on WordPress was to have all my random musings and research in one place. I am still working out how I will use it the most intuitive way, but so far I am really impressed. I am sure there will be a blog at some point highlighting everything once I get it all figure out. So tomorrow will begin my mass exodus of organization. Wish me luck! This entry was posted in Blogging, Organization, Writing and tagged Blog, Blogging, just write, organization, procrastination, sporadic thoughts, Writing, writing methods by Writer Owl. Bookmark the permalink.